Ships today if you order in the next 11 hours 12 minutes. Our pets' health is important, and we want them to be able to stay healthy and active. However, during the aging process the cartilage in our pets’ bodies may start to break down, and they may need extra help. 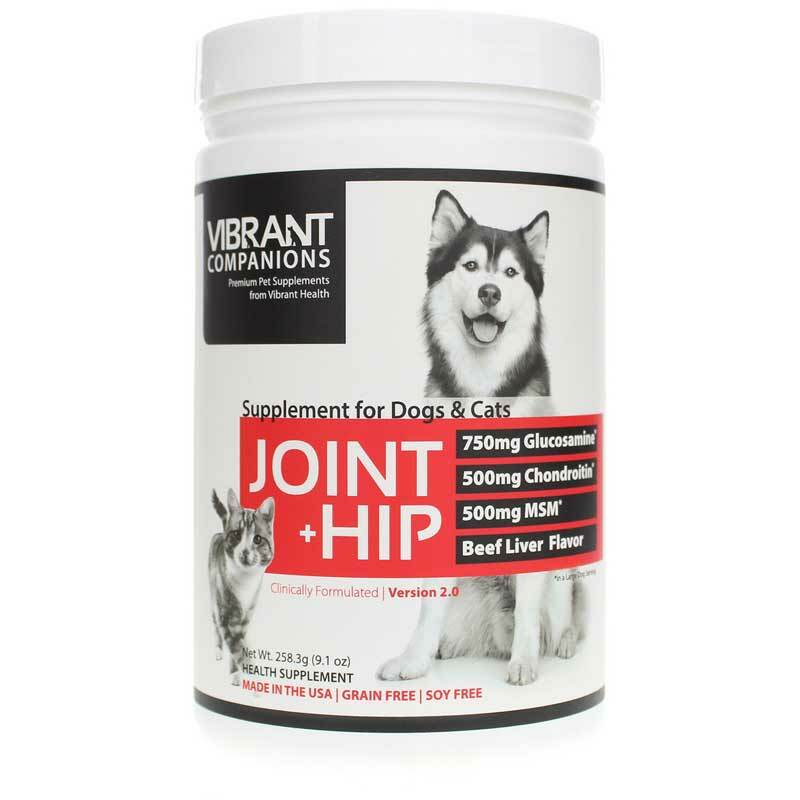 If your pet needs joint support, you might consider a supplement like Joint + Hip from Vibrant Health. Based off their Joint Vibrance (designed for humans), Hip + Joint is specially formulated for both cats and dogs, and offers support for joint and cartilage health. 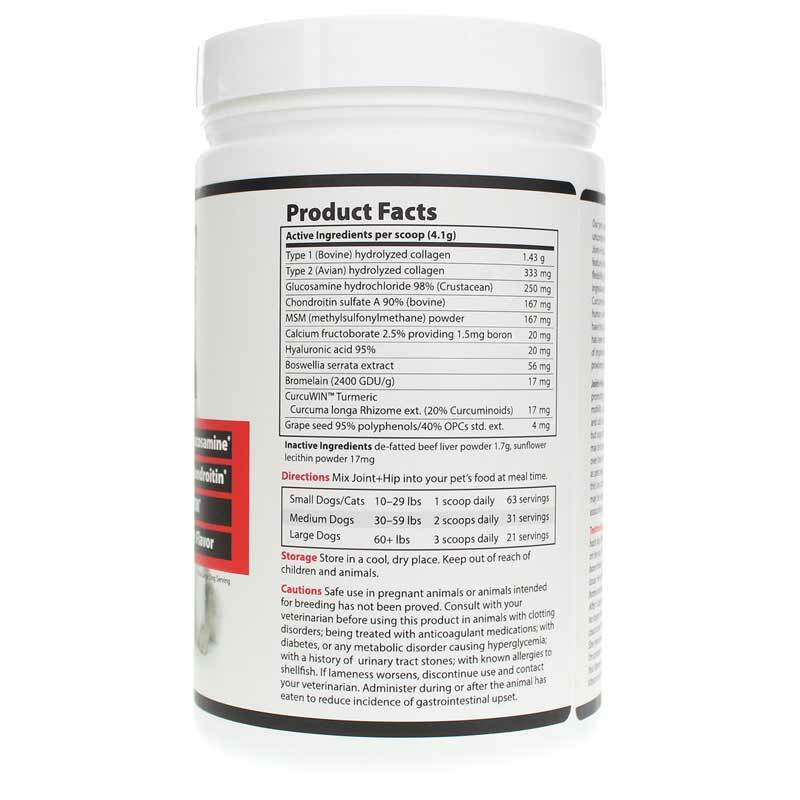 This supplement is made with a blend that includes collagen, glucosamine, MSM, and bromelain. It seeks to support your pet’s joints and promote mobility. This beef liver-flavored powder can be easily sprinkled on your pet’s food and is grain-free. Your pet’s health is important. 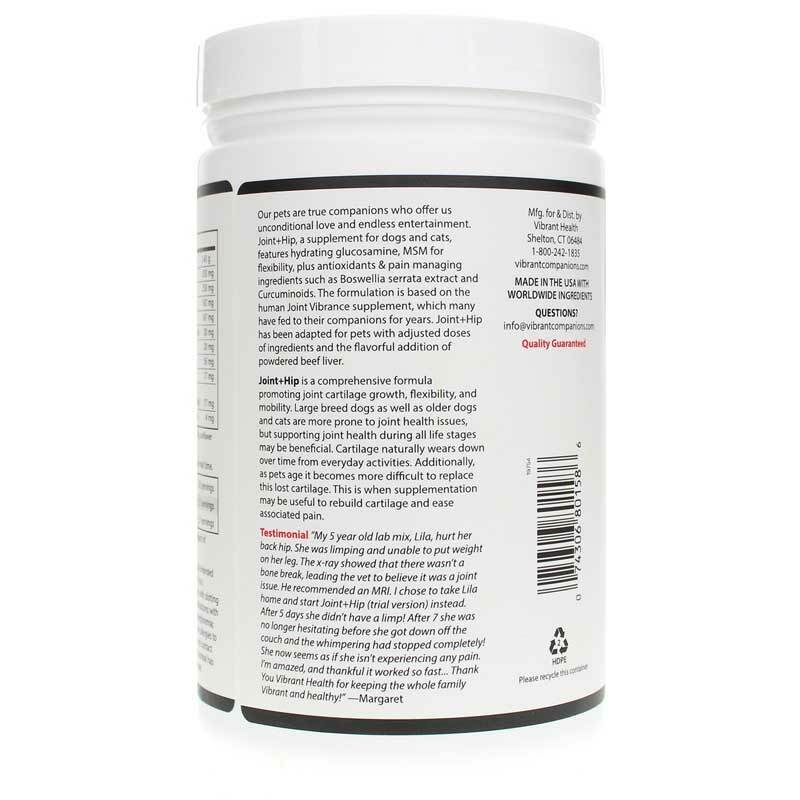 Support joint health, cartilage health, and mobility with Joint + Hip from Vibrant Health. Inactive Ingredients: sunflower lecithin powder 16.7mg, de-fatted beef liver 1667mg. Mix Joint + Hip into your pets food at meal time. Small Dogs/Cats 10-29lbs: 1 scoop daily. Medium Dogs 30-59lbs: 2 scoops daily. Large Dogs 60+lbs: 3 scoops daily. Keep out of reach of children and animals. Cautions-Safe use in pregnant animals or animals intended for breeding has not been proven. Consult with your veterinarian before using this product in animals with clotting disorders; being treated with anticoagulant medications; with diabetes, or any metabolic disorder causing hyperglycemia; with a history of urinary tract stones; with known allergies to shellfish. If lameness worsens, discontinue use and contact your veterinarian. Administer during or after the animal has eaten to reduce incidence of gastrointestinal upset.